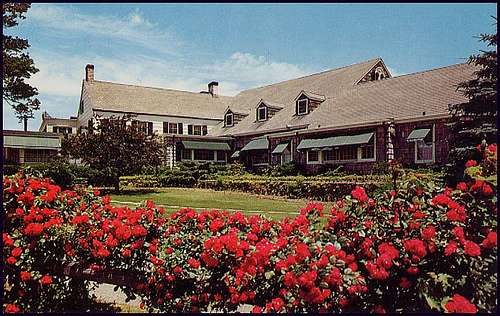 The Milleridge Inn in Jericho is one of Long Island’s most picturesque restaurants. The original part of the restaurant was built as a two room house back in 1672 by the Willets, a Quaker family. The house grew along with Long Island. It was used to quarter Hessian and British soldiers prior to (and perhaps during) the Revolutionary War. The home witnessed the winds of war and the onset of independence. By the 1800’s the house had expanded to a gracious two story abode with many outbuildings. It was then that the owners of the home opened it to the public as an inn for travelers. The date that the fire struck is not recorded, but not only was the house badly damaged, several members of the resident family perished. The original section of the house was relatively unscathed, but the top floor with the bedrooms needed to be completely rebuilt. The structure continued to be used as a family home as well as an inn until the 1900’s. About 50 years ago, the Milleridge Inn opened in what was once the historic wayfarer’s inn. When my sister Dee went to work at the Inn during her college years in the 1980’s, she became aware of a small room on the second floor that most staff were wary of. It was a tiny room, perhaps a nursery at one time. In it was an antiquated bed, a chair and a crib. She noticed that it was always ice cold in the room. Perhaps that was because the confines of the room contained the air conditioning more efficiently than the larger rooms. But the old furniture, rather inexplicably kept in the little room, not even displayed as a historic diorama, kind of creeped everyone out. The manager during that time complained that often he would be upstairs in his office after close and he would hear footsteps approaching his room. He would think it was one of the closing crew coming upstairs to tell him they were ready to leave for the night, but when he would look out, there was never anyone there. He often had the feeling of being watched. As part of regular maintenance, during my sister’s tenure, the corridors and rooms of the old inn needed to be repainted. In order not to disturb the thriving business of the popular restaurant, the management hired a painting crew who agreed to work after the restaurant had closed for the evening. The painters who worked on the ground floor had no issues. The crew in the upstairs had to deal with cold breezes and inexplicable feelings of being watched….and watched intently. Finally, about two in the morning, when his co-worker had gone downstairs for a cup of coffee, the lone painter left on the second floor was overcome by the sense that he was being stared at. He turned, expecting to once again find nothing behind him. Instead, to his horror, he found a family of three: a man, a woman and a small boy standing at the end of the corridor, just a few yards away, all gazing at him in stony, disapproving silence. The painting of that corridor did not get completed that night. Regardless of the sad little family that may haunt the inn, it is a beautiful place. Many weddings and special events are held there. I have never gotten the chance to eat there, because when I moved from the Island when I was just a teenager and never had the funds to splurge on what was then a top level restaurant. I cannot attest to the restaurant now. My sister Dee went back and had dinner there for Mother’s Day and found that the top floor had been renovated since she had last been there and the little creepy room was no more. I may never have eaten in the restaurant, but I do recommend…if you are in the vicinity of Jericho, that you stop on by and admire the gorgeous building and visit the quaint “village” they have next to the inn. There’s a great bakery, a general store and other places for you to stroll and shop. I used to love visiting those stores when I was a kid. When I go back to Long Island this December, I’m planning on a side trip to revisit the shops, just in time for Christmas! ← What’s Haunting Your Graveyard? I love ghost stories like these! Thanks for sharing. Went for a holiday birthday party or diner there once. Beautiful place. Especially the smaller shops of the small village. This was during the summer. After dinner our party decided to stroll about and enjoy the antiques in various rooms downstairs and upstairs. Old furniture and dining room were downstairs with the crib and an old door. Both were beautiful, as were the dining room’s prime antiques. Felt strange when entering alone though. Not many people went through there. Shrugged it off. Upstairs, at hallway’s end was a large, spacious room without furniture. The walls and decor were beautiful. Noticed it was very cold in that room. Figured it was the air conditioning. Thought maintenance kept it on too high or the ventilation was off. It became very interesting however upon leaving the room. The coldness stopped abruptly when stepping into the warm hallway. Curiously, I stepped back in. Wham! Hit with the room’s solid coldness. Stepped out into the hallway again. Warm. If the room was too cold wouldn’t the transition between cold and warm be smooth, gradual? But it was like a moving through into and out of a solid block of coldness filling the room. I began to wonder. Then I read the article above concerning cold breezes, the feeling of being watched, and three apparitions. More people were in the room when I went. They admired the decor. Only a few people mentioned the coldness’ intensity..
Now I realize the coldness represented spiritual presences. According to the above article, three of them. Wow! Fantastic place! Went back three or four times. Freidns and I make it a tradition for holidays and birthdays. had several paranormal experiences here….a glass flew off a table by itself..water turned on by itself in the upstairs bathroom..yes i do believe this place to be haunted.. I was there for a wedding last night. As I went to walk into the ladies room, a woman popped her head out the door and asked i I had been knocking. Why would I knock? The door to the large, multi-stalled bathroom was open. I had seen no one by the door as I had walked across the lobby either. I suggested that maybe it was the bass from the music. She said no, there was a loud and distinct knock on the door that made her leave her stall and open the door. Weird! i have heard that also!! one night a few summers ago i went to dinner with my husband..it was very late we were the last couple to leave the premises. i went upstairs to the bathroom..i was in the stall and i heard the water running. i opened the door no one was in there!! i checked the stalls…i told the manager about it he told me of customers having experiences in this place..